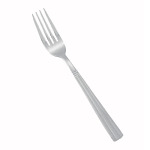 Dinner Fork, 18/0 Stainless Steel, Medium Heavy, Regency Pattern. "then dinner fork you see on the pictures is actually 1 inch shorter then the knife, that blow me away. never see it before a fork that is shorter..."
"then dinner fork you see on the pictures is actually 1 inch shorter then the knife, that blow me away. never see it before a fork that is shorter then the knife bye that far."